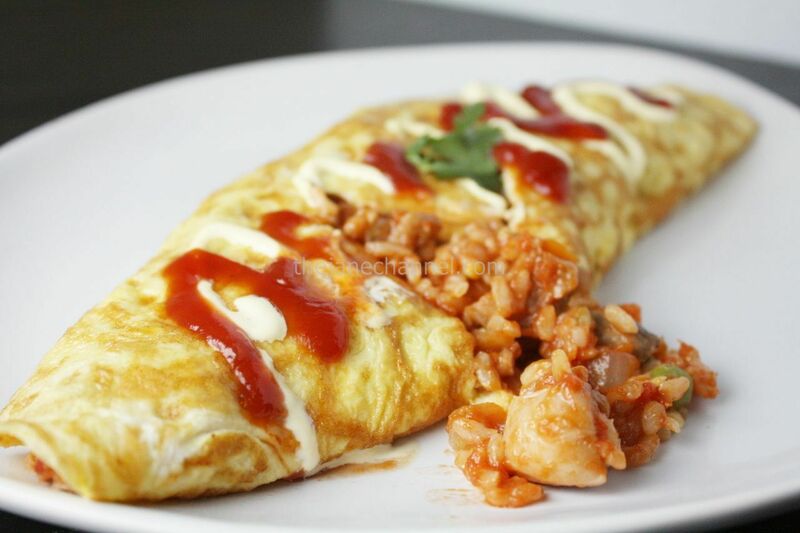 As you may guess from the name, “omurice” comes from the combination of the words omelet and rice. 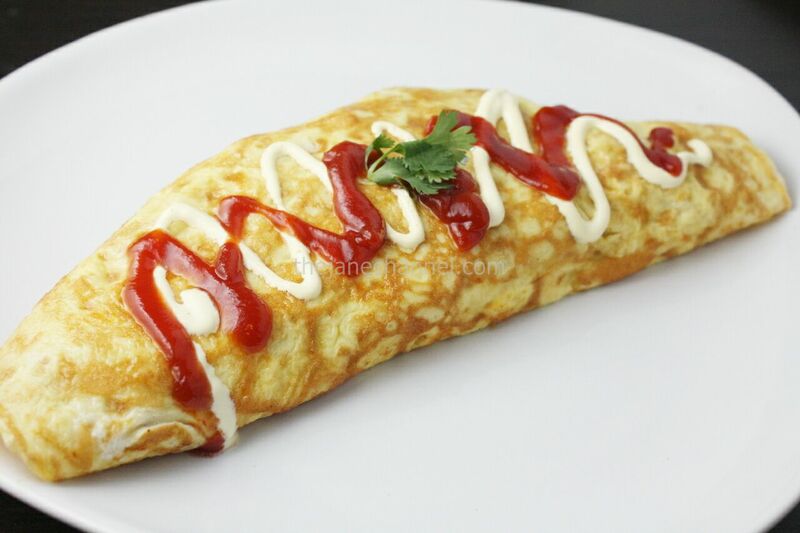 A Japanese’s Western-style (yoshoku) rice dish, Omurice is chicken fried rice with tomato sauce, wrapped in an omelet with sauce on the top. Marinate chicken pieces with soy sauce, sesame oil, sugar, and cornstarch. Place in fridge for 30 minutes. Heat oil in skillet over high heat. Stir in garlic, cook until fragrant. Add onion, cook for 2 minutes then add mushrooms, corns, peas, carrots and bay leave. Stir-fry for 2 more minutes. Remove from heat. In a separate skillet, heat oil over high heat. Add chicken pieces and cook for about 2 minutes. Add sake and cook for another 2 minutes or until the meat is cooked through. Set aside. In the skillet, combine the chicken pieces with vegetables. Remove the bay leaf. Add rice, crushed tomato, Worcestershire sauce, soy sauce and ketchup. Optionally, add salt and pepper to taste. Mix well and set aside. In a small bowl, whisk two eggs with 1 teaspoon of creme and a pinch of salt. In a skillet, heat oil or butter over medium heat. Pour the egg mixture on the skillet. Quickly spread the egg and make a round omelet. 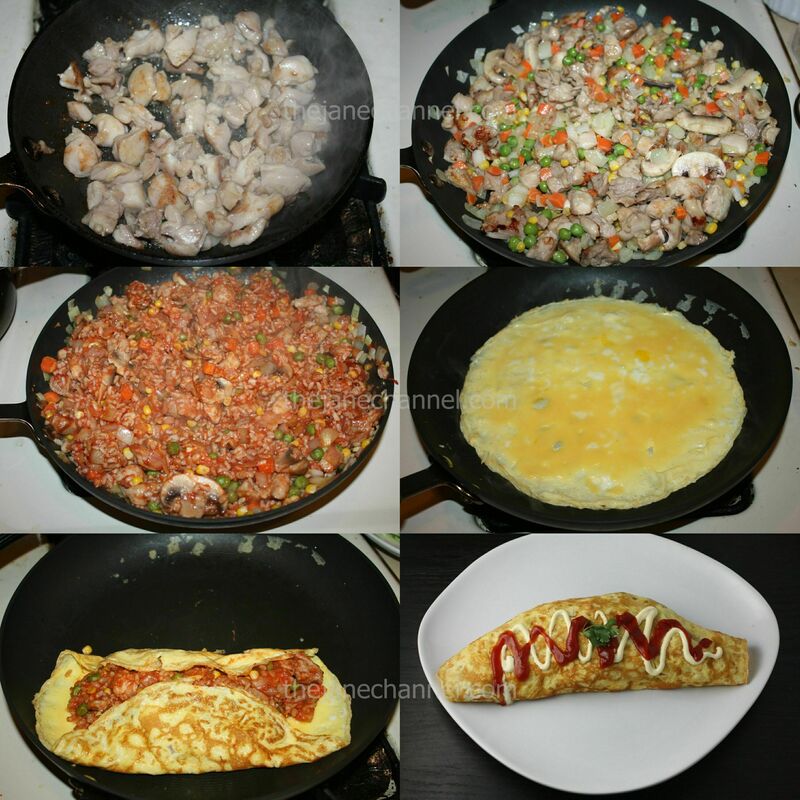 When the omelette is nearly done, place some rice mixture in the middle of the omelet and fold top and bottom sides of omelet over the rice. Place a plate over the pan and flip. Use a paper towel to help shape the omelet. I never had before. It looks AWESOME. For a heartier protein, I’d probably like to see steak/ beef. Mmmmmmm. Hehe. It kinda looks like a crepe. It looks so good.